It seems that you can’t go a day without reading an article about current and emerging trends in continuing education—from micro- and just-in-time learning, to mobile technology and gamification, to virtual and augmented reality. But these tools and tactics are just the means to an end. Behind the jargon is a macro-level trend of greater significance: how we deliver education is fundamentally changing because our understanding of how people learn best is changing. The origins of this shift can be traced all the way back to the K-12 classroom. The school-aged learners of today will soon be the adult learners of tomorrow. And their current classroom experiences are going to affect professional development programs in the future. We spoke with four long-time K-12 teachers to discuss how and why the classroom has changed, and how this has changed the role of both the student and teacher in the learning process to better understand how continuing education programs may need to evolve to meet the needs and expectations of tomorrow’s workforce. All four teachers we interviewed indicated that the K-12 classroom has undergone a significant transformation in the past decade. While each represented different grade levels, subjects and school districts, they all identified the same five themes present in today’s educational environment. All of our teachers remembered a day early in their careers when they were essentially handed a textbook that served as the class curriculum. Each day consisted of some amount of rote instruction, with lessons pulled directly from the book. The learning, as one teacher noted, was much more “spoon-fed” to students, with some moderate amounts of hands-on or group activities to enhance the lesson. Today the curriculum is much more generalized, with teachers being given guidelines on the topics that need to be covered and the foundational skills that must be learned. But it is up to the teacher on how they want to deliver the material. As a result, teachers are given a lot more freedom to get creative with lesson plans. One example from a foreign language teacher illustrates this perfectly. Historically, foreign language instruction included memorization of vocabulary lists. But this does not promote true language fluency. Many of today’s teachers are ditching the standard vocab tests and instead approaching foreign language instruction using the same building blocks we used to learn our first language—through active listening and speaking for the duration of the class, using relevant, real-life applications. In one Spanish teacher’s example, she has students answer questions about themselves in Spanish as best as they can, and the class takes notes. She then plays a trivia game where the students guess things about their classmates based on the notes they took. With the migration away from a pre-defined curriculum, teachers spend less time at the front of the classroom telling students what they need to know. In today’s classroom, the teacher often models new material and then, “lets the kids run with it,” moving through the classroom to provide guidance. Teachers are also spending more time working with students to set learning goals and helping them craft a plan to reach these goals. Conversely, this means the students have more accountability, as they play a more active role in their own learning. With increased participation and accountability, students are also given greater flexibility in choosing how they learn best. For one teacher, subjects from math and science to social studies can be taught any number of ways. Given the same subject and learning goal, some students may decide to use art supplies to create a project, some may use a computer program, while some may make a movie or slideshow. Our teachers agreed that technology has played a large role in this transformation. Tablets, laptops and other devices have become substantially more prevalent in the classroom. Two of the school districts have implemented a 1:1 ratio of student-to-device, while others supply a variety of devices for use in the classroom. These devices help facilitate a more personalized approach to learning. Math apps, for instance, allow the learner to follow a self-guided path based on their current level of proficiency. Instead of simply putting pen to paper, students can use technology to perform research on-the-fly and bring concepts to life. What’s Driving These Changes in Classroom Learning? 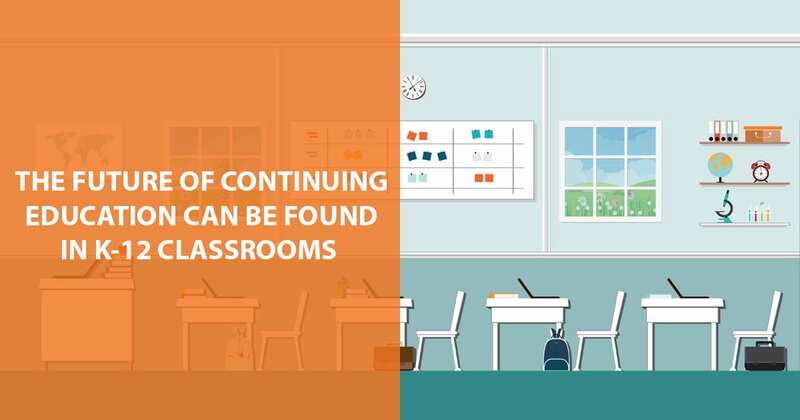 For training and education professionals focused on adult learning and professional development, these changes in schools could have a major impact on curricula and certification assessments for future CE programs. These young professionals will enter the workforce expecting their learning experiences to be delivered in a way that is consistent with their previous schooling. Now is a great time to start experimenting with small changes to existing programs to see what works best. Does all the learning have to take place during the course or in the classroom? Are there opportunities to provide real-world applications of the material within a certain timeframe that can then be used for a future assessment? Are your instructors capable of evolving their role from teacher to facilitator? Do they have the skills to adapt the material from the course book in creative and personalized ways? You’ll want to provide options for how your learners interact with an apply the course material, while keeping your workload and budget manageable. Can you achieve this by providing simple guidelines for your learners, while putting them in charge of how they want to learn? While it’s impossible to predict the future, taking a glimpse into the K-12 classroom certainly provides some indications of how principles of adult learning will continue to evolve. Each organization will have to determine the best way to adapt in order to achieve program goals in a way that realistically aligns with resources.